At its meeting on 19 May, State Council made determinations about a number of issues. State council opened with two condolence motions, one recognising the Union activism of recently deceased life member Peter Hellawell, and the other in response to the school shooting in Texas. The QTU continues to stand in solidarity with our colleagues in the US as they fight to ensure that their schools, their workplaces, are safe for themselves and their colleagues. One of the key discussions was the effect of the QTU’s ban on NAPLAN Online and processes going forward. State Council was of a view that work should commence on attempting to reach agreement with the department around the processes and workload connected with conducting the test. Additionally, Council noted the commitment of the Queensland Government to conducting a review of NAPLAN. An update was provided regarding the pilot of highly accomplished and lead teacher (HAT and lead) and the ongoing work in attempting to progress the value of role matter in the timelines within the certified agreement. Reports were received from participants in the ULead conference in Canada, Labor Notes conference in Chicago, and the American Educational Research Association Annual Meeting in New York. Council also celebrated a number of workplace campaigns on both professional issues and facilities issues and their successful outcomes. The day included the Queensland launch of the Fair Funding Now! (FFN) campaign, including a report from AEU Federal President Correna Haythorpe, and the commencement of the term two membership growth campaign. The growing membership of the QTU has contributed to an improved financial position, which has resulted in the establishment of an office in Springwood that was officially opened on 26 May. Emerging issues in education and the need to be proactive, rather than reactive, on a range of issues have resulted in the establishment of an additional research officer position within the Union. QTU Executive member and current acting Industrial Advocate Craig Wood was appointed to the role. Key membership issues such as disciplinary procedures and investigations and Independent Public Schools (IPS) were also discussed. 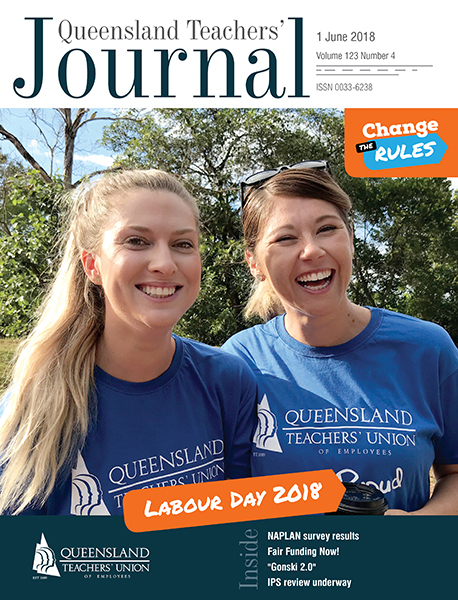 In terms of investigations and disciplinary procedures, the QTU has been progressing numerous issues using the dispute resolution procedures over the past few months. In response to the stage three dispute, the Director-General has communicated with the QTU, and the Union will be involved in work with the department in coming weeks on addressing the issues previously identified and reviewing the processes. The federal government released several reports during the period between March and May Council which will inform the next education funding agreement. These reports are the Lifting our Game Report (relating to early childhood education), the Independent Review of Rural and Remote Education, the STEM Partnerships Forum and Through Growth to Achievement (colloquially referred to as Gonski 2.0). Council considered the QTU summary and identification of issues arising from these reports and their implications for schools in Queensland should all recommendations in these reports be adopted by the federal government. An analysis of the Federal Budget was also received, with a particular focus on its impact on both TAFE and schools. Finally, the QTU Council moved a motion to condemn Federal Education Minister Simon Birmingham for his degrading and ill-informed comments regarding TAFE and the courses it offers. These comments showed the federal government’s continued lack of support for and investment in TAFE as a provider of VET and adult education. Members in TAFE will also be participating in a trial workload survey with a focus on compliance and enforcement of the certified agreement.